Looking for a fantastic book for a read aloud for next year? Definitely take a look at this! Ms. Weeks and Ms. Varadarajan were gracious enough to let me interview them for School Library Journal's BeTween feature, and I'll make sure I post a link to it when it appears in May or June. 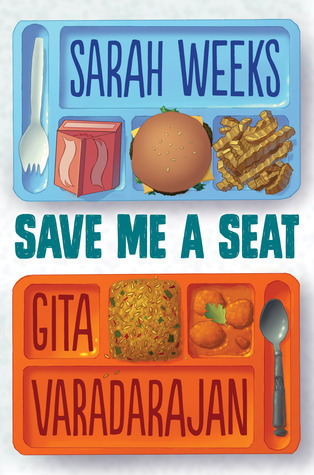 In the mean time, ask your students what fictional characters THEY would have at their lunch table, and find yourself a copy of Save Me a Seat to read this summer! Ravi (pronounced rah-VEE, please!) has just moved to the US from India with his father's job. It's very different, especially since his grandmother and grandfather are now living in the same house with his family, instead of just down the street. Since he was popular in his old school and did well academically and in athletics, he has every confidence that things will go well at that the popular Dillon Samreen (who is American born but still Indian) will be his friend. Unfortunately, his teacher has a hard time understanding his accent, and the children make fun of his buttoned up shirt and formal ways. He is sent to a resource room with Joey, whom he thinks is an oaf. Joey is very large, but also suffers from an auditory processing problem. He is easily distracted by noises, so needs assistance with organization and tuning things out. His real problem this year is that his mother has gotten a job as a cafeteria lady! He is frequently the target of Dillon's jokes and petty thievery, so tries to help out Ravi even though the other boy is rather rude to him. When the class has a big assignment, can the two band together to outwit the rude Dillon? Strengths: This was a tremendously interesting book. I loved the descriptions of FOOD-- between Joey's mother's comfort food and Ravi's lunch tiffin, I was hungry while reading this! The cover is fantastic. This would be a great book to read with a class to help build empathy. There's a lot of "putting oneself in another's shoes" in this book, but the two authors do a great job of keeping the story moving quickly. I especially liked that Ravi was surprised that he is not popular, and at the end, realizes that he was mean to other boys at his old school in the way that Dillon is mean to him. Weaknesses: I find it hard to believe that Dillon got away with so much bad behavior. There are two new students at my school who are struggling with English language acquisition, and reading this made me worry for them! I hope they are being treated much better by our students! What I really think: I love Weeks' Regular Guy and wish that this had more of the goofy humor of that book, but I still really enjoyed this. Definitely purchasing and recommending! I've seen a few really positive reviews for this book. It sounds like a good read!